The new art for Pren. So over the last year, while writing, I've been making art for Chariot. Much of it you can see on this blog, and some of the pictures I've been happier with others, and generally, in my head right, I've been making what I think are nice digital pieces and naïve outsider-art watercolours that fill in the gaps left by those, but which were to me secondary and probably in my heart of hearts not quite as good. When the Chariot crowdfunder started I got the inevitable feedback, some of it brutal and unhelpful, because nerds. To my astonishment, however, even the people with useful feedback had positive things to say about the watercolours and hardly anyone had anything good to say about the digital art. People like the watercolours, and as I went on I found that I liked making them. More to the point, the stuff I personally thought was strongest... Yeah. People who like games have an antipathy generally towards digital art, regardless of quality or competence, beyond that of people who aren't in the field. I think it's partly because of how 3d art is used in certain circles (and man, not going there), and partly nostalgia (because as anyone who's looked at more than a few OSR books can tell you, it sure as hell isn't the quality). Anyway. The single most useful piece of feedback was that even if the two styles of art were both good... they don't go together so well. The thing should have a unity, visually. Either one goes or the other does. I thought hard about this for a while and you know what, I might like my digital art (my Sky-Chariot, built laboriously from triangles and squares in Blender, was my mobile wallpaper for like the last year) but I'm making a thing with a home-made sort of feel to it, and so... Well, I think I made my choice. In the process of production, I also contacted Canadian graphic designers Winter-Hébert Studio, and I spent my cut of the crowdfunder profits on getting them to do a beautiful and appropriate cover design for me. 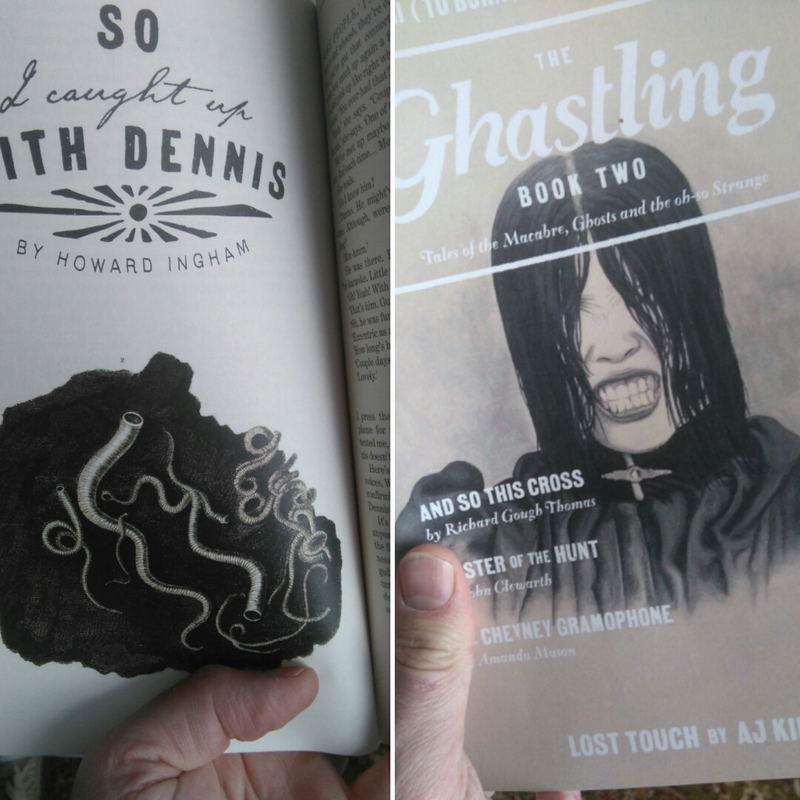 Nat and Catherine are responsible for the visual design of The Ghastling, a beautiful, artisanal horror magazine that I've had work in, and I fell in love with the way they approached my own story and the general look of the magazine. Not pictured: gorgeous creamy paper. In the meantime I've done sixteen new watercolour pieces for the book. Well, I say watercolours. What I mostly do is draw an image in pencil and/or ink, then I scan it, clean it up a bit, print it onto watercolour paper using a laser printer, so the ink is impermeable, and then add colour with watercolour pencils and pans. This generally creates something that looks sort of Tarot-cardy. Some of them are the best I've ever done. I want it to look beautiful. I want it to look rough-hewn and somehow true. Work continues. ETA for pdf is hopefully end next week. For print, a week or two later.